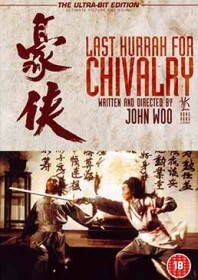 John Woo’s themes of male-bonding and complicated antiheroes are clearly prevalent in this cracking chopsocky. The film features a combination of Shaw Brothers and Golden Harvest talent, and there is a lavish sense of style with colourful sets, vivid characters and a textbook array of quirky villains. Here we see a young Woo honing his style within the cliched confines of a period genre piece, long before he would gain international acclaim for replacing swashbuckling sword battles with gun fights. It’s still blinding fun, if a little bit moody, as the brilliant Lee Hoi-san wipes out Cheng Lui’s family, who then employs master swordsmen Wei Pei and Damian Lau to exact his revenge. It’s not quite as simple as that, as Woo spins the story into a real tapestry which sets the film at a much higher standard than your average fight flick. The combat is damn good too, particularly the raid on Lee Hoi-san’s mansion complete with ninja bodyguards, a guy with a dart rope and the wonderfully comic ‘Sleeping Wizard’.